We meet Hannah Beharry, one of five athletes in Ealing to secure a place on Team Ealing - the Council's ambassador grants scheme, in a coffee shop in Acton where she has always lived. She arrives looking a little tough and probably ravenous after a gruelling training session. With this in mind, we eye the pastries and cappuccinos, but Hannah is serious about her weight and her diet and just wants tea - with no milk. "I haven't always been so strict," she tells us, "I tend to eat KFC and chocolate - but if you're training you really feel it the next day. You feel sluggish and slow. I've had no KFC for six months now." The mark of true dedication. Her diet now consists mainly of proteins, carbs, vitamin tablets, lots of fruit and milkshake recovery drinks. Further evidence of Hannah's dedication and determination is that this 23-year-old, who looks many years younger than her age, gets up every morning between 4:30 and 5:00am to go and meet her coach Paulo Munhngo in Wood Green. She trains mostly in North London at Haringey Boxing Gym which takes her 1.5 hours to get to. Once Hannah relaxes, it is clear that along with her inner strength and determination she is also charming and has a warm, easy smile. But the pint-sized athlete probably wasn't a favourite pupil at Ellen Wilkinson School where, she says, "I used to fight a lot and not listen to teachers." Although she excelled in every single sport - playing hockey, football and running for the school, she shrugs remembering how little it meant to her. "I was selected to run for the Borough, but I wasn't allowed to because of my bad behaviour." "Luckily for me they never kicked me out, though. But my GCSE grades were so low I threw them in the bin. I just thought school didn't do me justice and these grades aren't going to help me. I'm going a different route." Hannah was put in touch with Connexions which helps young people aged 13-19 get to where they want to be in life. The experience wasn't useful for her and she was referred on to the Education Youth Service. "I was with a bunch of street boys there and I kept getting into fights with the three leaders." One of the youth workers, having seen Hannah fighting, said he thought she was good with her hands and asked her why she didn't try boxing. She made her way down to All Stars Boxing Gym in Harrow Road. Once there, she was fascinated, watching the training and sparring. "It's the first time I've ever sat still for four hours being intrigued by something." Hannah sought out the Head Coach, Mr Akay and asked him when she could start training. He said "females shouldn't box." "I just laughed," recalls Hannah. "It made me feel crazy. I weighed 11 stone then and I knew I needed to lose weight. That was when I decided I was going to be the first woman to box out of that gym." She started attending fitness sessions which girls were allowed to do and trained for two hours a day five days a week. After eight months Hannah asked again. "Let me box - I've lost weight now." But the answer was still "no." She continued training and then approached one of the other coaches, Vahed. "I said to him "If you train me outside I will pay you. I want to box at the Olympics." He thought I was talking rubbish." But after 6 months Hannah was 18 and Vahed announced that she was ready to spar in the gym. By that time, there were lots of women at All Stars. There is now a 'females only' session. But Hannah was sparring against men most of the time and felt it was time to move on. In 2007 she left to join Haringey Boxing gym. "There are loads of female boxers in Haringey. I loved it. I was treated exactly as I wanted to be. All the girls there knew who I was and I got loads of attention. I am sparring all the time. It's the best thing I could have ever done." 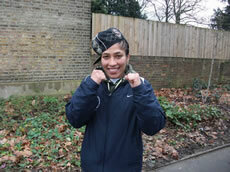 Terri Kelly is the 'matchmaker' in Haringey who puts people together for fights. But Hannah's face shows no signs of any knocks and dents. She explains that she has never been hurt in the ring. "You learn to defend yourself. It's all about footwork. We wear headguards and we are only allowed to hit in certain places, otherwise we get penalised. We wear protection over our breasts. The safety procedures are very strict and our gloves are very padded." Hannah tells us she is British no. 1 at 50kg and 48kg. The Olympic weight for Female Boxing is 51kg. "I just can't wait for the National Championships which are in Portsmouth this year. Then the World Championships are in Barbados in September." Hannah's smile lights up her face. "My grant from Ealing Council means that I can go to the World Championships and to Cuba to train beforehand with the best boxers in the world." As a member of 'Team Ealing', Hannah also gets free swimming lessons at Northolt Leisure Centre. "I have to overcome my fear of water. I'm determined to do that." Hannah is the second youngest of six. She lives with her mother and father and her five brothers. "My Mum is an amazing support to me. She and my brother Stephen have kept me going. I don't think I would be where I am today without them." Her mother has never watched Hannah boxing because of her religious beliefs, but she wants to see Hannah progress. "She supports me and is proud. Stephen comes to all my fights. When I find it's getting tough, he tells me to sort myself out. He trains with me when I need to get my motivation back. And when I needed a running partner he came with me - and paid for my gear when I couldn’t afford it." Hannah's enthusiasm for boxing is both inspiring and infectious. She is now a boxing coach for Active Planet and visits schools and youth centres to give inspirational talks. "I have no doubts. I am going to win a gold medal," she says. It's rare to meet someone so intensely certain of what lies ahead of them. Ultimately, Hannah says she wants to start a school in Acton. "I was an insecure, fat 16-year-old. Now I can stand up in front of 200 people and give a talk without getting nervous. I can box in front of 1,000 people without feeling nervous. 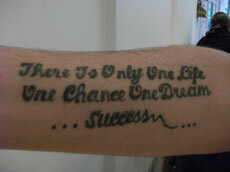 I am living part of my dream." "Boxing is what I wake up in the morning for." Each of the athletes in Team Ealing receives a £12,500 grant, paid in instalments, to help with the costs of training and competing at the highest level in the build up to the London 2012 Games. The team members were announced recently at the launch of Northolt Leisure Centre.